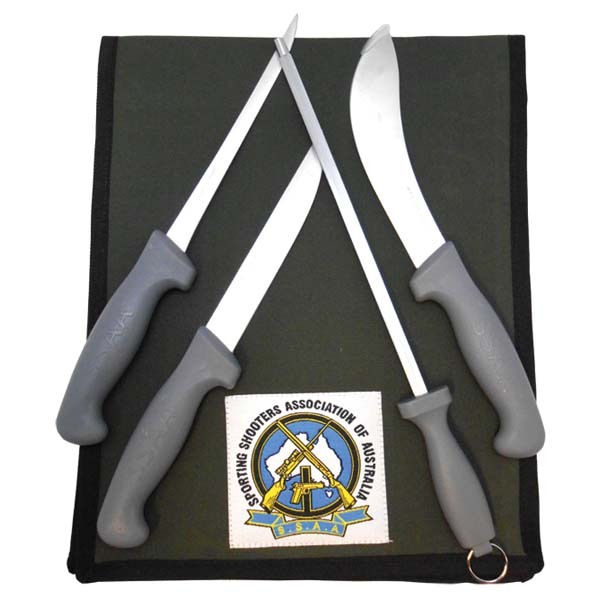 The SSAA Grey Knife Roll includes 16cm Boning Knife, 16cm Skinning Knife, 18cm Filleting Knife & 25cm Sharpening Steel. Blades made from 3Cr13 Stainless Steel. The SSAA Grey Knife Roll includes a heavy duty canvas knife roll to hold your set, which proudly displaying the SSAA logo. Please be aware, that you must be over 18 years of age to purchase the SSAA Grey Knife Roll. Ensure you enter your SSAA membership number correctly at the check-out!